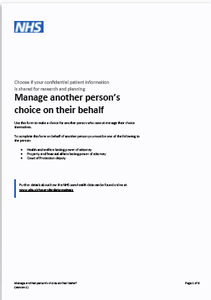 If you choose not to allow your confidential patient information to be used for research and planning, this will be respected and applied by NHS Digital and Public Health England. These organisations collect, process and release health and adult social care data on a national basis. 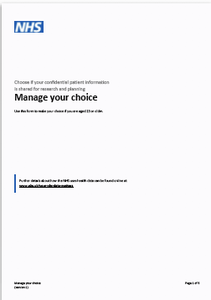 You may contact the NHS Digital Contact Centre to verify your identity and discuss your choices. We may be able to guide you through the online service or make a choice on your behalf. Open: 9am to 5pm Monday to Friday (excluding bank holidays). 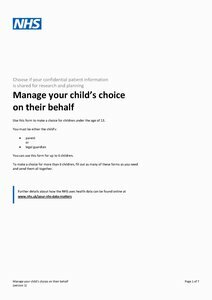 If you are unable to use the online or telephone service, you can use a paper print-and-post form to set a choice instead. How your data will be processed to register and apply your opt-out - Page opens in new window (opens in new window). Parents or legal guardians may set and manage a choice on behalf of their child under the age of 13. You can make or change a choice on behalf of another person, who is unable to make a choice independently. You must have the legal authority to do this. For example, if you have power of attorney.